In tarot, archetypes are closely connected to symbols and have come to include concepts which seem universal, models that are recognisable to all. Archetypes are clearly seen in cards such as The Magician, The Empress, The Lovers, The Hermit, etc. They are often found as characters and situations in mythology and connect to psychological theories such as those of Carl Gustav Jung. Each suit has 4 court cards: King, Queen, Knight and Page. In some decks, Page becomes Princess and Knight becomes Prince. Somewhat confusingly, King can then become Knight - see the influential Thoth Tarot for such an example. 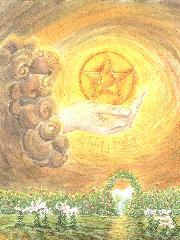 Tarot divination covers both prediction and connecting to excellence in the highest degree, i.e. helping people to develop into the best they can be. Some readers also feel that they connect to the divine / higher spirits through tarot. Tarot is often eclectic, with many deck designs drawing upon variety in this manner. 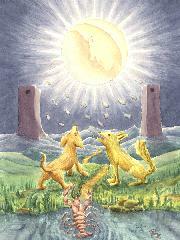 Interpreting tarot uses a great deal of eclectic application also. Fire, Water, Air and Earth; can be assigned to suits and to court cards. Some people refer to the Major Arcana as the fifth element of Spirit. Established in the late 1800s, this was an esoteric order, with connections to the Rosicrucians. Members could study ceremonial magic, astrology and tarot, and other occult disciplines. The Waite and Thoth decks were created by four members, both decks hugely influencing tarot since. The lightbox opens an image above the page you are viewing, with the page going dark behind it. By passing the mouse over this image near the top, you will find links to any previous and next images within the same lightbox. The 'Close' button at the bottom of the image returns you to the initial page. If your browser disables the lightbox function, the image will open in a separate page - use your back button to return to the initial page. Little White Book - this is a term commonly used to refer to the slim mini booklets that accompany most decks. Some are very useful and relevant to the particular deck they accompany. Often, though, they are not really specific to the deck, and are too small to provide much information. Occult has come to be associated with dark practices, due to the hidden aspect, perhaps, and 'transcending the bounds of natural knowledge'. A booklet written by A E Waite with tarot information, notes on the cards and traditional fortune-telling meanings. Waite recorded these meanings for information / study and held little regard for them. 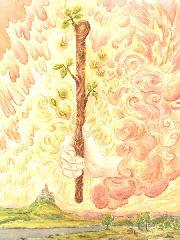 Pips are the suit symbols, so the Four of Wands will show 4 pips that are wands. Pips traditionally appeared on the cards designated Ace to 10, showing patterns in the way of normal playing cards. These have been replaced by clear scenes in many decks since the Waite Tarot published in 1910. Most people find the scenes easier for learning tarot. A notable and influential modern pip deck is the Thoth Tarot, and it shows pip cards can also be beautiful and meaningful. A suit in tarot consists of Ace to 10 - as normal playing cards - and 4 court cards. 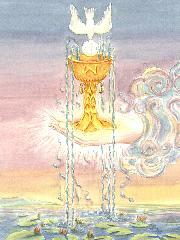 The suit names are Wands (aka Staves, Rods), Cups (aka Chalices), Swords and Coins or Pentacles. The suits make up the Minor Arcana. Suits names can vary a bit nowadays, renamed by deck designers, depending on the concept for the deck and what seems most apt. The basic ideas are not normally changed much though, with each suit correlating clearly to the above traditional ones. A common change is to name each suit by its element instead. 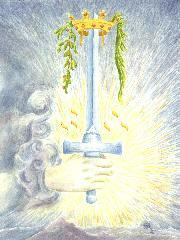 Synchronicity is often associated with tarot as part of how it might ‘work’. There are theories about coincidence which cover the way in which ‘the card’ appears - the right one at the right time - for someone. The theories of Carl Gustav Jung include connections between synchronicity and tarot. Tarocchi are the cards used for the historic game of Tarock, which is still played today. Tarocchi probably form the basis of tarot cards and were used for divination through the past few centuries (popular from 1700s) much as ‘normal’ playing cards have been used. Some tarock enthusiasts are not very happy about the connection to tarot reading and the way tarot is viewed. Hey, each to their own. A deck that is based on the Waite and applies a theme to the images, without really making many other changes. Examples include the Tarot of White Cats and the splendid Robin Wood Tarot, a pagan-themed deck which changes the images a little more, and which is another strong beginner's deck. The suit associated with active energy, motivation and inspiration; element is usually fire, but another fairly strong tradition assigns Wands to air (and Swords to fire).